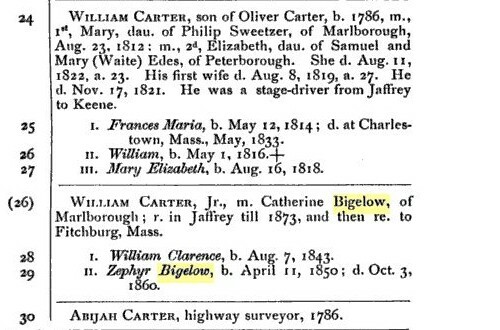 16136.82 Catherine 7 BIGELOW, dau of Nathaniel 6 (Nathaniel 5 , Nathaniel 4, Joshua 3, Joshua 2, John1) and Catherine (TYLER) BIGELOW, was born at Marlborough, NH on 29 March 1817. When one year of age, she moved with her parents and brother to Leominster, MA. She married William Carter, jr, of Fitchburg, MA on 02 June 1841. He was born 01 May 1816, the son of William and Mary (Sweetzer) Carter. They resided in Fitchburg after moving from Jaffrey in 1873. 16136.821 William Clarence Carter, b 07 Aug 1843; d _____ ;. 16136.822 Zephyr Bigelow Carter, b 11 April 1850; d 03 Oct 1860;.